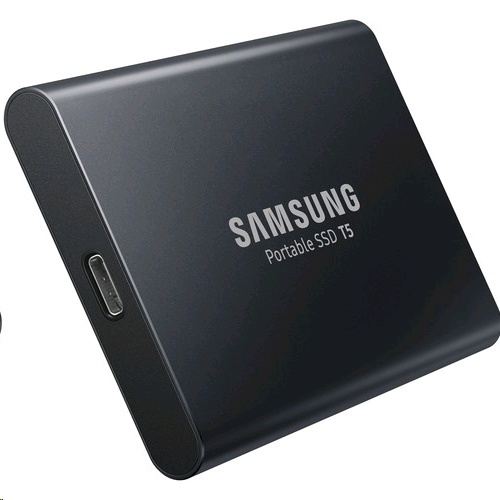 Keep your data backed up and available on the go with the Samsung T5 2TB USB External Solid State Drive. With a generous 500GB storage capacity, you'll have plenty of room to store valuable documents, photos, and more. It features a compact design for maximum portability and is password protected for security. With Samsung V-NAND flash memory and USB 3.1 technology, the T5 provides transfer speeds of up to 540 MB/s, which is up to 4.9 times faster than external HDDs. Transfers and backups of large-sized data including 4K videos and high-resolution photos will be quicker and faster. The T5's top-to-bottom metal design and rounded unibody framework allow it to fit comfortably in the palm of your hand. This T5 comes in an aluminum black finish. The T5 weighs 1.8 ounces (51g) with a thickness of 0.4" (10.2mm). The T5 has no moving parts and a sturdy metal body, so it can handle drops of up to 6.6' (2m). The optional password protection with AES 256-bit hardware encryption keeps your personal and private data secure. Manage your data easily with an intuitive software program for Windows and Macs systems to set up a password and download the latest firmware updates. A mobile app for Android smartphones and tablets is also available via download. The included USB Type-C to Type-C cable and USB Type-C to Type-A cable provide seamless connectivity without the hassle of purchasing additional adapters.